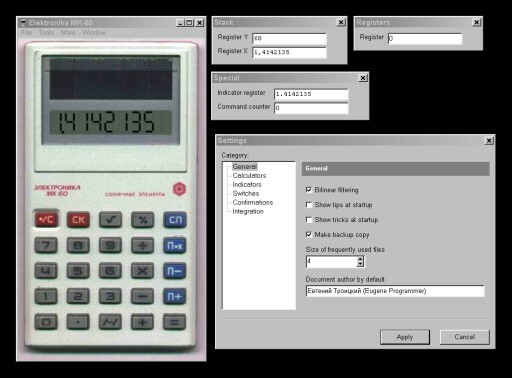 Here you can download the new version of Calculators 3000 [Version 5.1 from 13.05.2004]. Calculators 3000 (aka C3000) is a simulator of soviet calculators like B3-34, MK-61, MK-52 and others. It is available for Windows 95/98/NT/ME/2000/XP. 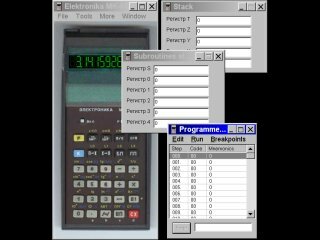 Hit the download link to download the latest version of Calculators 3000 [Version 5.1 from 13.05.2004] (1.8 Mb). Also you can download photographs of calculators of higher quality for Calculators 3000. Size is 4.2 Mb. Unpack it over standard photographs. Here you can download scanned pages of "Technology towards the youth" magazines. All these pages are in DjVu file format. For view these pages you can use DjVu Web Browser and/or DjVu Solo programmes. You can freely download it from www.djvu.com site. Thanks to Alexey Oleynikov and Alexey Razin for scanned articles from these magazines. Here you can download scanned pages of "Science and life" magazines. Rubrics "Programming for Beginners", "Man and Machine", "A Person with a Calculator". Thanks to Alexander Borisov for scanned articles from these magazines. calculator emulator, calculator simulator, calculator, calculators, elektronika, B3-34, MK-61, MK-52, MK-54, programmable calculator, arithmetic calculator, scientific calculator, programmable calculators, arithmetic calculators, scientific calculators, soviet calculator, soviet calculators, russian calculator, russian calculators.